direction. The cover ring is optionally available in black and is easily repainted in any color to blend in with the environment. 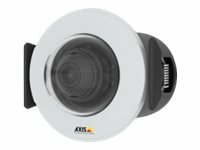 AXIS M3015 provides HDTV 1080p video with WDR ensuring visible details in dark as well as bright areas of a scene. Axis Zipstream technology reduces bandwidth and storage with maintained video quality.